Like a lot of young men today, Jason Wilson, CEO of the Cave of Adullam Transformational Training Academy in Detroit, grew up without his father around. Struggling with his emotions and resentment toward his mother, Wilson turned to the martial arts. 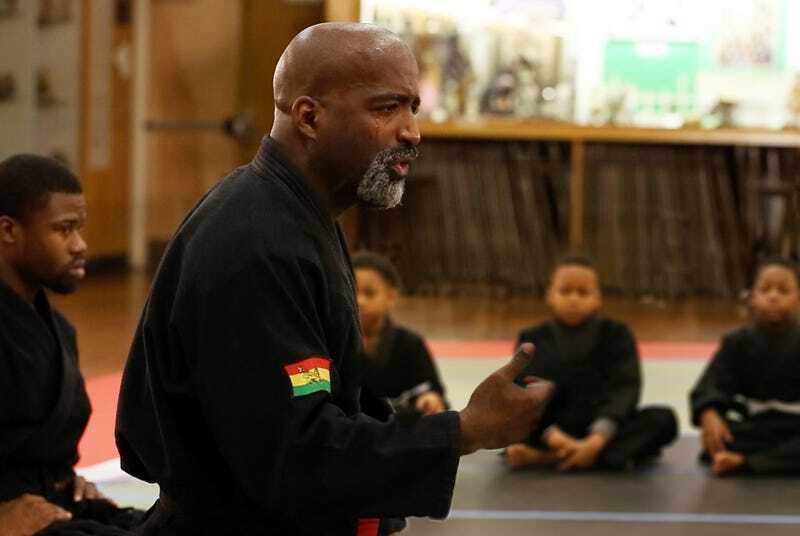 Today he’s turned his childhood struggles and his passion for martial arts into an acclaimed academy for young boys, incorporating mentorship into martial arts training. Wilson’s teachings and mission are well-documented through his YouTube channel and have caught the eye of people around the world. A video of Wilson’s “Son-up” ceremony, which was widely circulated online last year, landed him appearances on The Dr. Oz Show, Steve Harvey and Ellen: The Ellen Degeneres Show. The characters Jack and his adopted son, Randall, enroll in a similar martial arts program in order to bond and give Randall some black male role models in his life. Near the end of the episode, we see Randall on his father’s back as Jack does a series of pushups, just like those shown in Wilson’s video. After public and legal pressure, 20th Century Fox, the production company for This Is Us, eventually acknowledged in a tweet that the idea came from one of Wilson’s viral videos. Wilson says that the producers of the show “made it right,” and he got a chance to speak with them about the significance of his program. Wilson’s work at the Cave of Adullam Transformational Training Academy, started in 2008, is more than a martial arts program but, rather, a rite of passage into manhood. The boys engage in a combination of mentorship and jiujitsu, combat boxing and other martial arts, taking anywhere from three to five years to finish. One of the focuses of the program is allowing the boys to identify the roots of their anger and emotions. Wilson pulls a lot of what he teaches from emotions he experienced growing up without his father. “Growing up, I started resenting my mother, and this happens over and over with boys,” Wilson says. He wanted to ensure that the boys in his program had a space where they could express their emotions. Wilson’s 2016 book, Breaking Through Emotional Barriers: The Four F’s to Emotional Freedom, was his first step toward bringing his methods to those outside the academy. He was also recently asked to lead morning sessions for Steve Harvey’s mentoring weekend in Atlanta this summer, which will allow him to share some of what the academy does for more than 300 young boys. Through the academy’s curriculum, 78 percent of students improve their GPA without even needing tutoring, and 56 percent see a decrease in school suspensions, according to Wilson.